A beautiful, very hardy perennial; the root grows 8-10 feet long set with rings and circles toward the upper part, cut smooth and without joints down lower, brownish on the outside, and very white within, with a pith in the middle, and the plant grows 1 foot tall with broad, spiny, grayish-blue leaves and pale blue flowers surrounded by spiny bracts. The tough, spiky leaves are of a pearly-gray color. The flowers are blue and mildly scented. blooming at the end of summer. Seeds follow the blooms a month later. The flowers are frequently dried for winter bouquets. Another variety: Also called sea holly (E. alismaefolium), called “Momono Kaiyu” by the Paiutes, the Native Americans steeped the whole plant to treat diarrhea. This is a tiny plant 2 inches high and is rare. Found on sea coasts. A native of Europe. The decocted root, known as Eryngo, not to be confused with (E. aquaticum) which is also called Eryngo, was once a favorite sweetmeat. It is still popular in the Middle East. Roots and leaves are used for uterine irritations and bladder diseases, glandular deficiencies, used as a nervine and tonic. The decoction of the root in wine is very effective on the spleen and liver, helps jaundice, dropsy, treats the French pox, ague, swollen lymph glands, snakebites are healed rapidly, pains of the loins, colic, promotes urine, expels stones, and promotes women’s menses. The roots are nutritious and can be candied for a confection. 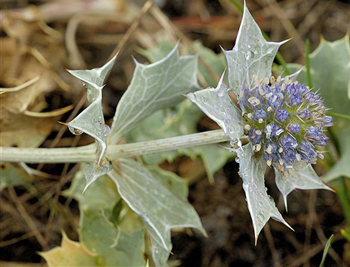 Like most plants with fragrant blue flowers (lavender and violet), sea holly is good for nerves.